AT RC: a living room of 38 m2, a kitchen overlooking a bright conservatory and terrace; and a room for couples and a bathroom with shower and toilet. UPSTAIRS, 2 rooms for couples, and a children's room with bunk beds. possibility cot for baby and accessories ;. and a bathroom with tub and toilet. Also at your disposal, 2 TVs and VCRs. Smokers are accepted to the extent that they agree to smoke outside on the terrace. The four adults in our family loved this house and location! The house itself was lovely, well appointed, roomy, and had all conveniences. We especially enjoyed the back yard, and sitting outside under a protected awning to have breakfast, lunch and some dinners. We love to cook, and had found everything we wanted in the kitchen, and also used the barbecue. It was very pleasant sitting outside on lounges reading in the shade. The house and yard were even nicer than pictured. We used the washer and the dishwasher. The lovely garden was filled with flowers. There was enough space for the two couples to have privacy and still share good times together. Paule was very friendly, helpful, and accommodating. We made a friend, indeed. The location of the property was perfect for us. It was quiet, but close to the beach, and a good walk to the town, although sometimes we drove to the old town. Our adult children rented excellent bikes which were conveniently delivered to the house. They rode everywhere, discovering new places and thriving on the coastal air. We thoroughly enjoyed visiting new sites together as a family, especially Mt. Saint Michel, Dinard and the old city. The fireworks over the castle on Bastille Day were amazing, and the walk around Il Cite d Alet was lovely. We recommend the galettes and going to the local markets. One favorite beach was Minihic, very close drive. This house would be perfect for couples and families. There is much to do in the area with chlldren and lots of interesting sites for adults too. La maison est très bien placée pour visiter St Malo, notre hôte met tout en œuvre pour nous accueillir au mieux avec beaucoup de gentillesse, nous recommandons. J'ai été très heureuse de vous accueillir. Les enfants ont été supers et encadrés par deux mains de maître. Merci pour votre appréciation. Très jolie maison au calme. Le jardin est magnifique. La propriétaire est charmante. Merci beaucoup pour votre appréciation. Je garderai également un très bon souvenir de vous quatre. On a passé un très agréable séjour. Les photos sont très représentatives. 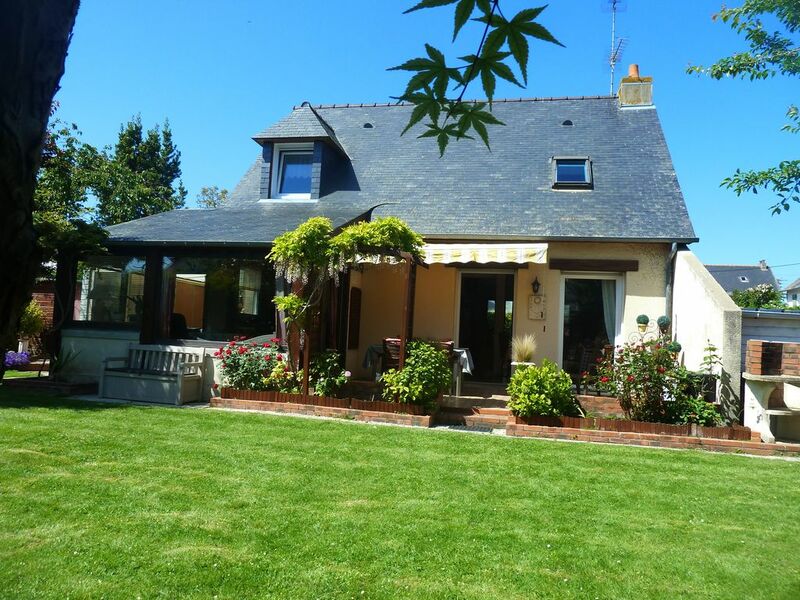 Maison spacieuse, jardin agréable, parking aisé, à 15 min à pied des plages et 5 min de la boulangerie. Ravie que votre séjour se soit agréablement passé. Je garderai un bon souvenir de votre petite famille. Merci Madame et moi je garde un excellent souvenir de votre séjour avec votre petite famille.